Friday, April 24th is the two year anniversary of the the factory collapse at Rana Plaza in Bangladesh that killed 1,134 apparel workers and injured more than 2,500 who labored in sweatshop conditions. JCPenny, Walmart, Mango and Zara sourced clothing from Rana Plaza and have not yet donated to the victim relief fund. This week, under global pressure, Children's Place donated $2.5 million to the fund, setting an example that other chains should follow. This afternoon, members of the Northeast Pennsylvania Industrial Workers of the World participated in a global day of action to demand justice for Rana Plaza workers. We delivered a letter to JCPenny at the Viewmont Mall in Dickson City, asking the store manager to forward it on to corporate headquarters. Shoppers were impressed and supportive. One hundred years ago, northeast Pennsylvanians labored in similar sweatshop conditions as silk mill owners from Carbondale to Hazleton exploited children as young as 12 working six-day, fifty-seven hour weeks. In 1910, federal investigators in Scranton found that more than 30 percent of girls between thirteen and sixteen were working for a living and five thousand children under sixteen working in the silk mills throughout Pennsylvania. In 1901 and 1907, thousands of boys and girls working in the silk mills throughout northeast Pennsylvania, empowered by IWW co-founder Mary "Mother" Jones' organizing here, led strikes for better pay and conditions. Inspired by the successful Lawrence Strike and the ongoing Paterson Silk Strike, in February 1913, 1,200 silk workers in Hazleton, mostly young women, went on strike and voted to join the IWW. Organizers were arrested, including nine young striking women who were accused of attacking older men with clubs and stones who were going to work as scabs. The young women shouted as they were dragged away, "Iron bars cannot stifle our freedom!" Globalization of the textile industry shuddered the mills here and opened them in the Global South, where corporations could exploit the absence of labor protections like workplace safety. Rana Plaza building collapse of April 24, 2013, the deadliest disaster in the history of the global garment industry. We ask that you listen to the survivors and victims’ families who are simply asking for justice for the hardworking people that produced your apparel in Bangladesh. The families of the 1,138 workers who lost their lives and the 2,500 injured survivors have suffered deeply as a result of JCPenney’s refusal to provide full and fair compensation. Even those who survived without much physical injury continue to struggle with trauma and economic destitution, including unemployment, homelessness, lack of proper healthcare, and the inability to afford an education for their children and siblings. 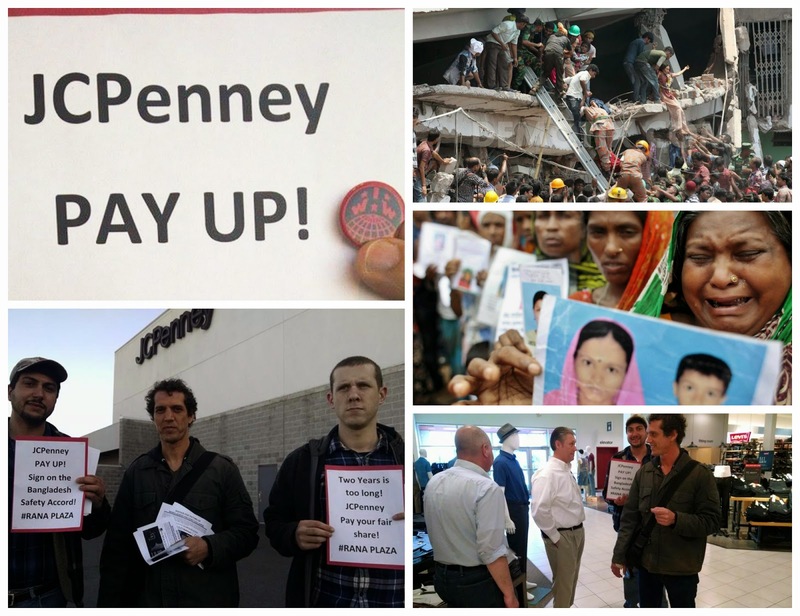 JCPenney can easily afford to pay the compensation still needed to complete the Rana Plaza Donors Trust Fund, in order to ensure that the injured workers and families of the deceased don’t have to wait any longer for the compensation owed to them. We expect that our sentiments will be shared directly with your headquarters.